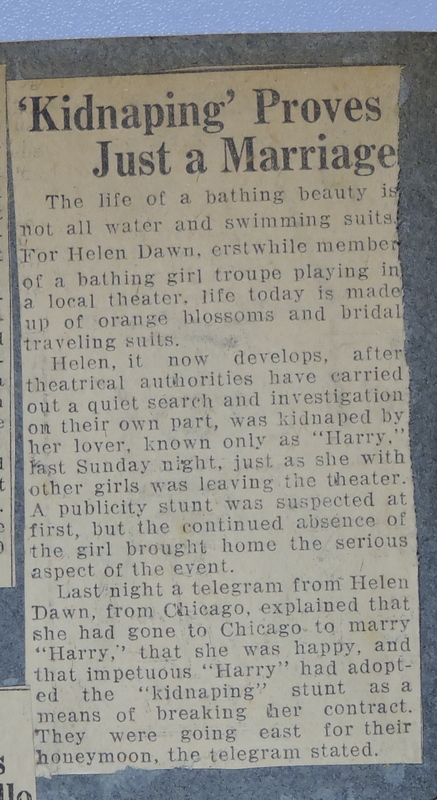 Although a number of stories including a press agent version were afloat concerning a reported kidnapng Sunday night of Helen Dawn, 16-year-old prize beauty of the “Bathing Beauties,” now playing at a Peoria theater, (see ads) police were trying to locate the girl and arrest her alleged kidnapers Monday. According to reports made police Miss Dawn with Betty Bryant and Donna Darling, companions in the same troupe, came out of the rear of the theater shortly after 10 o’clock, Miss Dawn and Miss Bryant in the lead. As they turned the alley at Jefferson avenue a short stocky built man leaped from the side of a closed Oakland or Hudson car and seized Miss Dawn by the arm. Despite her screams he dragged her to the side of the car and another man inside helped him get the girl into the car. The man who grabbed her leaped into the car and the driver seated alone in the front seat drove away going out Jefferson avenue. The screams of the girl attracted a large crowd, some of whom picked up several articles and some money which Miss Dawn dropped when she was seized by the man. “Oh, they got the one with all the diamonds,” one of Miss Dawn’s companions is reported to have said during the “kidnaping,” according to an interested spectator. All press agents refuse to be interviewed about the incident. Fitz Hugh, 224 North Jefferson avenue, who with a companion, was in a car nearby, started in pursuit of the “kidnaper’s” car but lost sight of it on Jefferson avenue. Police were scattered in riot cars in all directions and Detectives Boyser and Welty were dispatched out the Galena road in search of the girl. According to Miss Byrant [sic] and Miss Darling, who were eye witnesses Miss Dawn had no time to struggle with her assailant. “The man grabbed her and had her inside the car so quickly that neither of us could interfere,” Miss Bryant said. Both girls gave the same account of the “kidnaping” to police who quizzed them Monday. The girls said the car in which Miss Dawn was taken away in was an Oakland or a Hudson car. They said Miss Dawn had joined the troupe at Los Angeles and that at none of the cities they had visited did Miss Dawn make any acquaintances who might injure her. 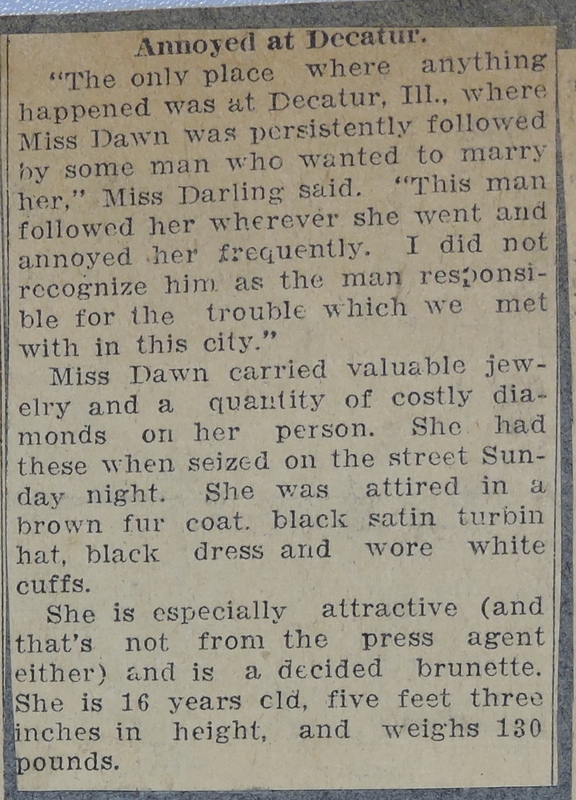 Miss Dawn carried valuable jewelry and a quantity of costly diamonds on her person. She had these when seized on the street Sunday night. She was attired in a brown fur coat, black satin turbin [sic] hat, black dress and wore white cuffs. She is especially attractive (and that’s not from the press agent either) and is a decided brunette. She is 16 years old, five feet three inches in height, and weighs 130 pounds. What happened to Helen? Was Donna part of a publicity stunt? Another article clipping explains what happened. The life of a bathing beauty is not all water and swimming suits. For Helen Dawn, erstwhile member of a bathing girl troupe playing a local theater life today is made up of orange blossoms and bridal, traveling suits. Helen, it now develops, after theatrical authorities have carried out a quiet search and investigation on their own part, was kidnaped by her lover, known only as ”Harry,” last Sunday night, just, as she with other girls was leaving the theater. A publicity stunt was suspected at first, but the continued absence of the girl brought home the serious aspect of the event. Last, night a telegram from Helen Dawn, from Chicago, explained that she had gone to Chicago, to marry “Harry,’ that she was happy, and that impetuous “Harry” had adopted the “kidnaping” stunt as a means of breaking her contract. They were going east for their honeymoon, the telegram stated. Apollo Theater, Peoria, IL – Photo courtesy “Granola” via Cinema Treasurers. The Apollo opened in 1914 could seat over 800 in its auditorium, The theater closed in 1958. In 1988 the Apollo was purchased and lovingly restored to its original appearance. Since 2001, it has housed the Apollo International Film Group, which screens foreign, classic and independent movies in an early 20th century setting. Today it is known as the Apollo Fine Arts and Entertainment Center. I learned that Donna played at the Apollo in Peoria, IL the week 1 February 1925, which is a new venue for Donna. I also learned the cast names for her Bathing Beauties Revue. For this week’s Treasure Chest Tuesday, I’m looking at clippings from the Donna Darling Collection relating to her playing at the Apollo Theatre in Peoria, IL, in 1925. Donna’s clippings from her time in Peoria are some of the most interesting clippings that I have. First, there is a list of her Bathing Beauties cast, a never seen before photo of Donna, and a good description of the show and what various individuals are doing. Second, there is something of a mystery for me to solve regarding the date she played in Peoria and the Apollo. Third, there is additional press about Donna and her troupe of beauties supporting the local American Legion. Finally, there is a mystery of the kidnapping of one of her cast members. There is also an amazing clipping of Donna, leaning back showing a leg. When Miss Darling left the coast she was followed by two life guards: Murray Earle, formerly a specialty dancer of “George White Scandals,” and Al Ross, late of Christie. These life guards are eccentric dancers who add comedy to the revue. Special scenic and lighting effects elaborate this unusual attraction. The costumes are elaborate from the opening of the revue to its end, at which time Miss Darling appears in a rhinestone bathing suit. “Fifth Avenue Models,” a picture completes the program. Second, I was a bit confused about the date of the show. Several clippings indicate the show began on February 1st, however, the movie that was playing with her show is identified in IMDb and Wikipedia has having been released on April 25, 1925, nearly three months after Donna’s playing. [i], [ii] It is unusual for a silent film to have been playing in a theater nine months after its release, so I was confused. I found that the British Film Institute indicates the film was released in 1924. Finally, the December 3, 1924 issue of Los Angeles Times has a preview of the film released by Universal. [iii] I have also found it playing at several other theaters long before April 25th; so, I’m convinced that both IMDb and Wikipedia are incorrect in their release dates. Third, there are two clippings relating to the ‘Bathing Beauties” helping the American Legion. I just love photos and a photo of the girls from the revue in their bathing suits is fantastic. 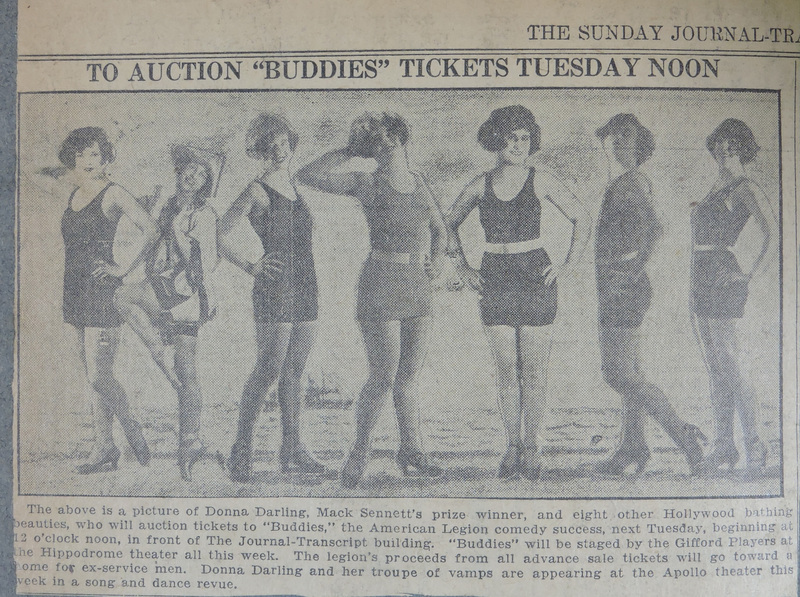 “The above is a picture of Donna Darling, Mack Sennett’s prize winner, and eight other Hollywood bathing beauties who will auction tickets to “Buddies,” the American Legion comedy success, next Tuesday, beginning at 12 o’clock noon, in front of The Journal-Transcript building. “Buddies” will be staged by the Gifford Players at the Hippodrome theater all this week. The legion’s proceeds from all advance sale tickets will go toward a home for ex-service men. Donna Darling and her troupe of vamps are appearing at the Apollo theater this week in a song and dance revue. Although it mentions Donna and eight others, sadly, there is only Donna and six others in the image. Pedestrians who passed by The Journal office today noon failed to resist the beauty and smiles of the “Bathing Beauties” who are now playing at a Peoria theater, and who proved themselves good saleswomen. During their brief selling campaign today, they sold 224 tickets for “Buddies,” the show now playing at the Hippodrome theater for the benefit of Peoria Post No. 2, American Legion. The position left vacant by Helen Dawn, who is missing from the cast, is being taken by Mildred O’Brien. No trace of the Dawn girl has been found, according to members of the troupe. The last sentence of the above article brings me to the kidnapping of Helen Dawn. I’ll post about that next week in Part 16 of the Donna Darling Collection.